What is in a Resin Bound kit? Each of our Resin Bound kits contain a 6kg unit of resin and hardener, 87.5kg of pre-measured aggregate and a 6.25kg bag of sand. Each kit must be mixed in a certain order with a Forced Action Mixer before trowelling. Which tools do you need to lay a Resin Bound kit? The essential tools are a Forced Action Mixer, drill and paddle mixer, wheelbarrow, bucket trowel, hand trowel, and RB Solvent cleaner. Optional extras include a screed sledge, edging strips, expansion joints and knee pads. Read our Resin Bound tools & equipment page for more information. This depends on the depth that you lay the material. If you lay at our recommended depth of 18mm for trafficked areas then each Resin Bound kit will cover 3.3m2. Alternatively, if you lay at 15mm recommend for pedestrianised areas, the coverage works out at 4m2 per unit. Useful tip! Better safe than sorry. Always order more material than you think you need. You do not want to reach the end of the job and find that you don’t quite have enough material to finish – we’ve all been there and there’s nothing worse. Ordering an extra few units makes up for any undulations in the base which use up more material than expected. Even if you don’t use the extra material it’s a waste as you can use the resin on your next job. If you’re unsure about how much to order, give us a call and we can advise you. Are they suitable for DIY use? How do your Resin Bound kits differ from other suppliers? 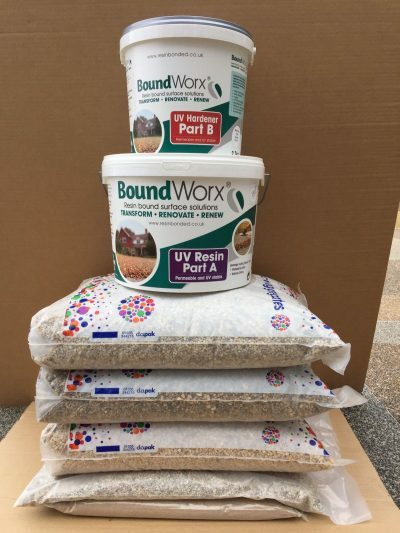 We sell our BoundWorx® Resin Bound resin in 6kg units which is slightly smaller than most of our competitors’ kits. Our resin bound kits are used with 87.5kg of washed and kiln dried gravel and a 6.25kg bag of clear quartz sand. Within that 87.5kg of stone is a 12.5kg bag of smaller aggregate we call fines. Fines help to knit the materials together and increase structural strength by providing more points of contact in the mix. The bag of sand included in each unit gives our resin bound kits an anti-slip property. The sand coats each individual stone to aid grip. Where further traction is needed we can supply a fine glass grit for scattering into the top of the surface. Some of our competitors supply a non-UV stable resin bound resin. All of our BoundWorx® resin is aliphatic, which means UV stable, so it will not discolour and turn a nasty yellow-brown. Click here to read a blog post which talks about the importance of UV stability. How many colours do you have? Some suppliers limit their finishes to just one size and colour aggregate, but our resin bound kits are blends of different sized and coloured stones. Blending the gravel in this way provides endless possibilities so we have a varied and interesting range. Since we were established we have created over 450 different formulations. Luckily for the end user, we have narrowed these to approx 30 different popular finishes in our current BoundWorx® range, click here to see our most popular standard aggregate finishes or click here to see our popular elite range finishes. If you have a specific colour in mind, contact us and we can create a bespoke finish. Give us a call with your area in m2 and the material depth. We can work out the quantities you will need and can provide an accurate quote. Alternatively, drop us an email to info@resinbonded.co.uk or fill out the website contact form. If you place your order before 11am we can despatch the same day for next working day delivery*. Some aggregates have a longer lead time, always contact us to check availability.